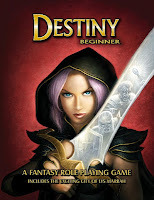 In this episode I review Destiny Beginner by Alexander Schiebel. Destiny Beginner is sleek volume at around 54 pages, but is packed with content without feeling too rushed or inaccessible. It is rather remarkable in that it aims to and largely succeeds in being a game for newcomers to role-playing. I have some personal quibbles with some of the presentation and mechanics choices, but take these with a grain of salt. This is an excellent product that tries to make the hobby accessible to new folks, in the vein of games like Fiasco and Mouse Guard. The layout of the book is a fairly standard two-column design. The choice of muddy grey background filter makes the cool border art fall a little flat and the text hard to read, especially the use of gray subheadings against a gray background. The individual art in the book is fantastic as are the fonts, so a bit of a mixed bag overall. The core mechanic of the game asks players to make check with two six-sided dice against largely fixed difficulty numbers. It reminds me a bit of Call of Cthulhu and even more of Unknown armies. I think this mechanic is a neat idea, but maybe went a bit far to make the mechanic new and different, rather than accessible. It's a similar issue to the one I have with FATE. To really play that game you need special dice to quickly find a result. To make die rolls fast in Destiny Beginner, I feel like you would want a tens digit d6. I can see why they chose their d66 mechanic in some of the game-play, but a percentage dice already exists in polyhedral dice, and I don't see anything in the mechanics that couldn't use two d10s with some scaling up with very similar probabilities. I wouldn't belabor this for a normal game, but this is intended as a beginner product. Okay, so those are effectively where my quibbles end. The text is extraordinarily well-written and clear, in a voice which feels accessible. It isn't a giant tome, one of the first barriers that stop people from playing tabletop games. In about 20 minutes you could read and understand all the mechanics of the game. Fully half the book is a fleshed-out but not bloated section of gm-advice for those new to gaming, an entire setting, and several adventures. Don't confuse the book's length with it being terse or incomplete, it just has the virtue of brevity. The stats are simple, but they have a lot of depth thanks to "The Great Gift," which makes your character have extraordinary abilities in one area and instantly establishing a niche for them. Characters may start a little similar at the first level, but quickly branch out. The system also synthesizes a lot of great ideas that indie games have brought us. There is a fate-point style mechanic to save flubbed rolls. Despite any quibbles with the dice mechanic, the fixed difficulty will really speed up rolls and play. Overall this is a game where mechanics are designed to fade out when not needed, easily accessed for new players. I've played a lot of pen and paper rpgs, so I have my quibbles, but I would definitely recommend this right alongside products like Mouse Guard to the pen-and-paper-curious folks out there. In a way this is a nice illustration of how all role-playing books should read. The simplicity of presentation and accessibility of the prose are the strongest elements of this product. Copious examples and clear text help this a ton. Even though some elements detract, this exceeds the detractors markedly. The Great gift gives some awesome niche distinction which would make the attributes a little bland, and its an easy fate-point like system to track. 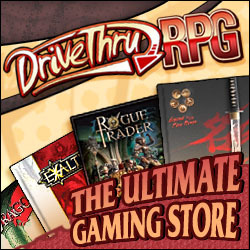 Despite some nitpicking on system mechanics, this is a very sleek and efficient system, simplified initiative, player-facing checks(mostly), clear GM advice/suggestions, and several out-of-the-box adventures included really shows that this product is really meant for newbies and could lead them into gaming, instead of just suggesting that their product might do it. The core dice mechanic is interesting, but seems very idiosyncratic, especially for the goals of a beginner product, rolling percentage dice has the same probability curve and polyhedral dice exist for it already. There are a lot of abbreviations and acronyms, which pull down the ease of use a little. SVh is a lot harder to understand than the "higher of your two dice." The constitution mechanic and attribute system, while very equalizing, seems like it would make characters seem a little too homogenous and you would lose a sense of niche. Everyone resists the same amount of damage at the end of the day, and two strongmen will be very similar at the outset. The Great Gift helps ameliorates this problem a bit.